RoyalEnfields.com: Royal Enfield: Made in UK? Made in India? Or both? Royal Enfield: Made in UK? Made in India? Or both? Royal Enfield made in England, shipped to India. 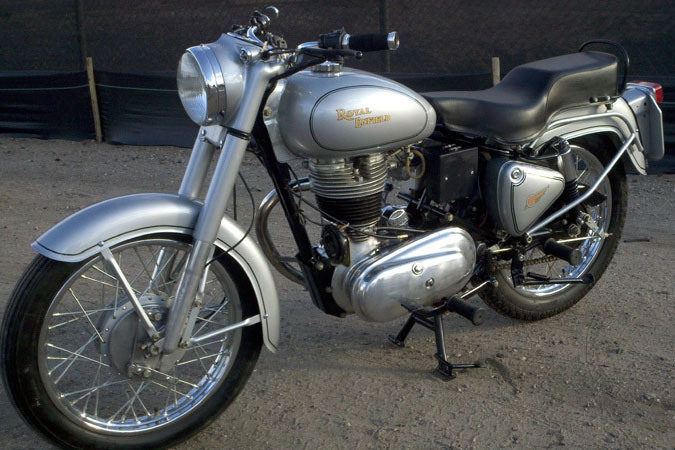 A 1964 Royal Enfield Bullet for sale on eBay in Denver, Colo. is the inadvertent subject of Internet discussion about how to tell British-made Royal Enfields from those made in India. "I personally purchased this bike in India from the original owner who has had it since 1964," the seller writes in his ad. "The bike and VIN has been verified by the chairman of the Royal Enfield Owners Club in England as 'Dispatched from Redditch on the 10th April 1964 to Enfield India.' I can provide a copy of this verification for the winning bidder. This Bullet had been well taken care of throughout its life and not abused like many of the Royal Enfields you see from India." He goes on to detail a thoroughgoing restoration: everything from complete dismantling and rebuilding of the engine and transmission to new wiring harness, tires, DuPont paint and clear coat finish. The brakes have been upgraded. The seller will ship the motorcycle by air. The only mention of a title is that it is "clear." The motorcycle went up for sale in the midst of a lively discussion on the BritBike Forum titled "Indian Bullet vs. UK Bulllet? What to look for?" "If I had two Bullets in front of me, one UK and one made in Madras, (other than obvious items like seats, signal lights, headlight frame numbers) how do I tell them apart?" the original poster asked. 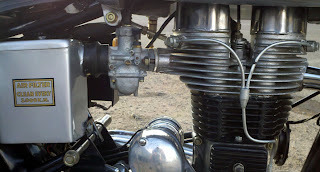 Answers ranged from humorous ("the UK one has clip-ons") to technical ( cast headstock from Britain, welded headstock from India) to equipment (steel tube center stand from India, cast alloy from Britain). The eBay ad entered the fray when it was cited as "an example of what folks can try to pawn off as a bike built in India from parts made in Redditch." "In 1964 Royal Enfield Redditch wasn't making any parts that would be considered correct on that bike. It was all Made in Madras, lock, stock, and barrel," alleged one writer. Another comment: "This photo nicely shows the bolted construction of the seat post tube that the India factory adopted. All Redditch versions of the early frame had formed tubes, which were welded at the seat post." "The REOC has always considered that any bikes recorded in the Redditch ledgers were produced in the UK. "These factory ledgers record 350 Bullets up to frame number 600xx (April 1964), which includes the machine the 'doubting Thomas's' are now discussing. The vendor provided me with photos of frame and engine numbers as requested and I verified the date. "The bikes were supplied to Madras Motors up until June, 1956, all of these machines being completely assembled as far as we know. From July, 1956 they were supplied to Enfield India. It is believed that all these machines were supplied in kit form, with an ever decreasing number of components over the eight-year period. "It is generally accepted that the tooling for the old frame went to India quite early on and that they revised the frame construction over a period. "It is also obvious that they were producing their own mudguards/brackets quite early on as these are a different shape to those from the UK. "Whilst the bike in question may well have some later Indian components, the photos supplied to me show the numbers quite clearly. They are not overstamped or tampered with, so the dispatch date taken from the Redditch ledgers is beyond dispute." Wow, I didn't know my innocent question about India vs. UK made Bullets would get so much attention! I am the original owner of a 1964 Royal Enfield Clipper 250cc. My father had a mc shop in Orange, Calif and I bought this RE. I am looking for any information on who,how, where and etc I can access on my restoration project I am planning on undertaking this year. My research to date has not turned up anything on my model. Anyone out there that can point me in a direction that ccan help fill in the blanks? Thanks. Anonymous, you can learn something about your Clipper by emailing Graham Scarth, chairman of the REOC at chairman@royalenfield.org.uk He will share with you what the ledger books show about the origin of your motorcycle. You can ask other questions at the Royal Enfield Yahoo discussion group. Wheels, Forks, rear shocks, center stand, handle bar levers, wiring, fuel tank and tap, carb, seat, points cover, tappet cover, tool boxes, and the mud guards are of a mis-matched 'pair'. Tim, thank you for your reply. I know you know what you are talking about. I wish I had your "eye" for details.